Disclaimer for this guide is that – we have not tested them. We are presenting the schematics, parts, circuit diagrams, codes for building DIY 7 segment LED display calculator which includes Arduino project. From their quality of presentation of schematics, it is almost obvious that attempt will not fail. Previously we wrote about history of calculator and Vacuum Fluorescent Display (VFD). Vacuum Fluorescent Display (VFD) actually elegant, easy to read but consumes battery more than LCD. Before pre-built calculators were available, kits were sold exactly like DIY kits sold now. Those hardware and softwares are also emulated now. Most of these are programming calculators. Keypad used usually push button switches. There is one somewhat known project named Kim UNO. That Kim UNO’s PCB is available as ready to use keypad and display, like SpikenzieLabs Calculator Kit. However the later is about $60 with shipping charges.You will get old used LED calculators on Ebay at 10-$15 price. CASIO FX-120 scientific calculator will cost $15 to $27. They are basically good at least for the case. The PCB design is also given clear manner. I am not sure where that where the Arduino Calculator Shield is easily available for human all over the earth at this moment. I guess that should be the end story of Arduino Calculator in future. This Article Has Been Shared 9220 Times! 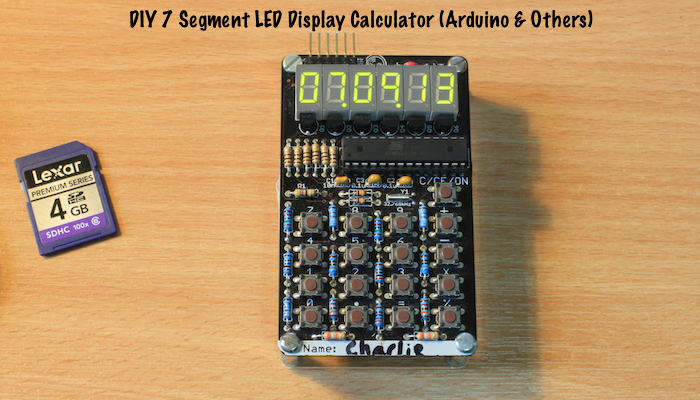 Cite this article as: Abhishek Ghosh, "DIY 7 Segment LED Display Calculator (Arduino & Others)," in The Customize Windows, March 28, 2017, April 21, 2019, https://thecustomizewindows.com/2017/03/diy-7-segment-led-display-calculator-arduino-others/.